Successfully Added Universal Socket GSM Smart Plug - Universal Socket, Quad Band, 2000W, 10Amp to your Shopping Cart. The GSM power socket is a remotely controlled power socket that allows you to switch on an off any the power supply remotely by SMS. Deter burgles by making it look like you're at home or take control of heaters, sprinklers, motorized gates, doors and pet feeders all with a simple message from your phone. 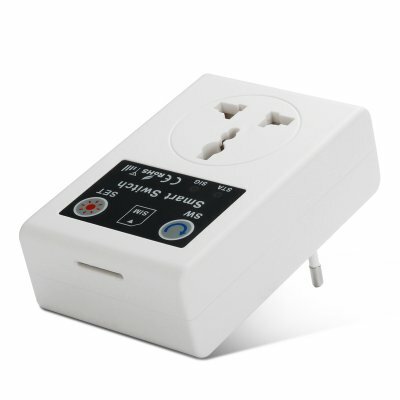 Suitable for EU type plug sockets this GSM smart plug has a universal 3 pin socket that can be controlled remotely form your Smartphone. You can use SMS (Short Message System) commands or locally control this GSM socket by its function buttons, and its quick and easy to setup. This will allow you to maintain the illusion of a presence at home of work even when your miles away just by sending a text message. Supporting all major GSM 850, 900, 1800 and 1900MHz this smart socket works with most 2G cellular services providing great global coverage. With a 2000W power rating and 10Amp output its suitable for a host of home and industrial applications, be it controlling remote access via motorized gates and doors, activating your sprinklers or control water heaters. With set and status buttons you can program the smart socket to only work with designated numbers allowing you to control those who can interact with it. Present a low cost solution to controlling your home appliance from the busy office or sun drenched beaches this GSM smart switch keeps you in control at every step. This Universal Socket Smart GSM adapter comes with a 12 months warranty, brought to you by the leader in electronic devices as well as wholesale smart home gadgets..
SET Button: Manually set the controller number. SIG Indicator: GSM signal indicator.